The measuring speed and accuracy of Coordinate Measuring Machines (CMM’s) are improving every year. Newer CMM’s are being designed and built to be shop floor “hardened” so they can function with repeatability right on the production floor. 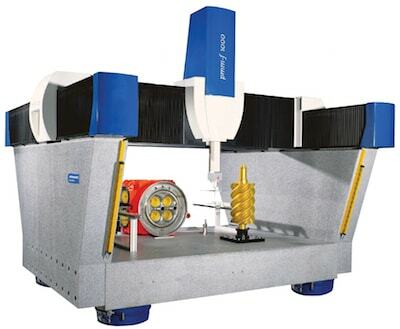 Vibration is one environmental factor which can compromise a CMM’s accuracy and repeatability. Ideally, if all components of a CMM, including the part to be measured, were to vibrate in unison at a specific frequency, amplitude, phase and orientation, no degradation in measured performance would result. Without compromising accuracy, CMM manufacturers provide their users with the maximum levels of vibration which their machines are capable of withstanding. This allowable vibration criteria is an important factor when considering if a machine requires vibration isolation or not. When isolation is required, it is typically low frequency (less than 30 Hz) vibration that requires attenuation. Fabreeka pneumatic isolators (PAL Isolators and PLM Mounts) provide significant vibration isolation for metrology equipment requiring low frequency vibration control.